Early on in my guitar youth, I always had a chip on my shoulder about Stevie. Not sure why, because I never really listened to him, etc. I was young and had a narrow opinion of music and styles. When I began to actually ‘study’ guitar a little bit and wanted to improve myself and learn, that is when my eyes and ears opened. I began to respect quality of play regardless of styles or genre of music. I started to *hear* tone and marvel at effortless play, that was truly inspirational. Stevie Ray Vaughan definitely captures that, but the point that blew me away was watching an episode of Austin City Limits with some old live footage. I was absolutely blown away by how he played. His aggression with the guitar, but how clean it was sounding. How effortless it appeared for him to lay down some serious licks. At that point… I said… “I get it now.. yeah, I get it”. He was amazing guitarist on multiple levels. I was excited to see a pedal board of Stevie Ray Vaughan the other day. His set up is very basic, tube screamer, vox wah and a couple of Fender amps. The tone definitely goes beyond the Strat and the gear. His hands and gnarly thick strings help. But you need the soul. Over the years his pedal board changed in configuration, and I’ll include the description that talks about the set up. The full article and other shots of gear can be found here at Premiere Guitar. Ibanez Tube Screamer: Stevie upgraded as new versions came out – TS-808, TS-9, TS-10 Classic. A fan reports that the chip in Stevie’s pedals was probably the RC4558 chip for clean boost. Wah-wah: Vox wahs from the ’60s. Occasionally connected two together. The usual setup in the later years was Ibanez Tube Screamer TS-10, Vox wah, vintage Dallas-Arbiter Fuzz Face, and Tycobrache Octavia. For a brief time he used a Univibe. Roger Mayer Octavias were used prior to the Tycobraches. Cesar Diaz installed matching germanium transistors in the Dallas-Arbiter Fuzz Face body to increase transistor life. 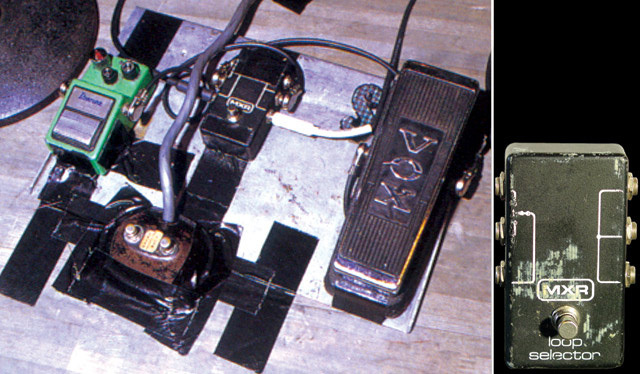 Loop Selector – Stevie had several MXR loop selectors in the early ’80s, one of which is in the author’s collection. The splitter box which later replaced the loop selectors was one input and six outputs to the amps. No preamp, but resistors to cut down the noise. With the Vibratone he used a Variac AC power regulator. Ibanez Tubescreamer TS9 Dream Theater – John Petrucci – Pedal Board Breakdown Steely Dan’s Jon Herington Pedal Board Best Wah on the Market Today? Pedal Line Friday - 12/30 - Ted HarmsGreat deal on the T-Rex Twister Chorus/Flanger at Amazon! -Every version of the tube screamer used the RC4558. It wasn’t a choice by any particular artist to specifically use it, that’s just what was in there. -I’ve never heard of anyone matching the transistors in a fuzz face to try to increase it’s life span. That makes no sense whatsoever. This sounds like one of those spurious comments to try to sound technical, but not really having all the facts. I think what he meant by the erroneous “matching germanium transistors” statement was that he replaced the old germanium transistors which were unstable and tended to overheat with new silicon transistors that had matching electronic characteristics. At least I think I remember a Cesar Diaz interview where he stated this. The silicon transistors last much longer if not forever. SO Jerry’s comment about “sounding technical” but not really having the facts is probably correct.